ATRE provides students with interactive, outdoor science and history education opportunities. 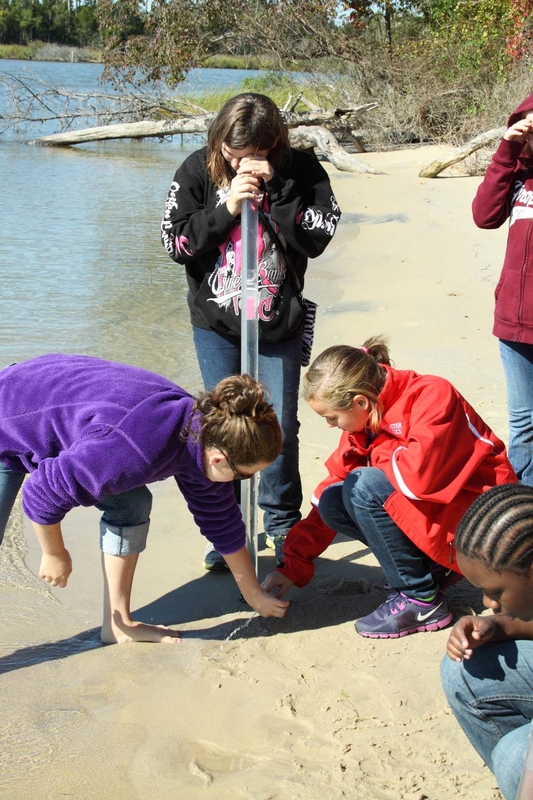 Our goal is to give teachers and students a safe, fun, hands-on experience that will inspire respect and stewardship for the Rappahannock and its watershed. Our curriculum is aligned with the VA Standards of Learning and National Science Standards and includes programs suitable for preschool through high school and beyond. Descriptions of our programs and registration information follow. Please contact Meredith Palumbo, Field Trip Coordinator, at fieldtrips@riverfriends.org for more information. Program Fees: $8 per child/student (snorkeling and boating prices vary, call for details). $80 registration fee (applied to the total program fee). Payment balance due the day of the program unless prior arrangements have been made. Minimum group visit is $80 (10 students). Adult chaperones are free. Special arrangements may be possible for groups where cost would otherwise prevent participation. Please Note: You will receive a confirmation letter when scheduled. Please let us know of special needs and we will try to accommodate them. All programs include river and trail safety instruction. Programs may be altered during inclement weather. Adult chaperones are free, please limit chaperones to no more than 1 per 5 children. Exceptions to the maximum chaperone limit are special needs children, home school, small preschool, and scout groups. No siblings, please. Cancellation Policy: Classes are conducted rain or shine unless weather is a safety issue. We will contact you as soon as possible to notify you of cancellation. If you wish to cancel a program, please do so at least 4 weeks prior to your scheduled program in order to receive a registration fee refund. In addition to visiting us at our nature reserve, we can now visit your class at your school for a pre-lesson that will correspond with the field trip. One of our educators will visit your classroom for a 30-45 minute lesson. This would be an extra $30 per class, in addition to the $8/student field trip fee. Spring trip class visits will be in January, February, and early March. Fall visits will be in September, late November, and January. Please let Meredith Palumbo at fieldtrips@riverfriends.org know if you are interested! Program A (1.5 hrs): Walking the Path of the American Indian – Discover how American Indians used nature to provide all their food, shelter, and water. Make pottery and experience the American Indian oral tradition with a story that still applies today. Program B (1.5 hrs): Walk Like the Animals – Use your senses to discover how the forest and river provide a good place for animals to live. Program C (1.5 hrs): Water Properties – Why does the river look different at different times? Little scientists will love to experiment with this question while learning about our beloved Rappahannock River. River Investigation Hike – Investigate the river habitat with your senses – observing, describing, and charting. Discover how animals use their senses for survival. Trees – Gain a better understanding of tree parts, trees as a resource, and why trees are so important to our river. Life in the River Habitat – Explore many different plants and animals along the river and discover why they live next to the river. New Program offering beginning school year 2018-2019 featuring Environmental STEM or E-STEM! – Our new E-STEM program offerings engage students in learning about the renewable natural resources of water, wind, or solar energy. Students design, engineer, and test solutions to environmental challenges while completing design challenges. E-STEM is creativity and functionality in one succint bundle of environmental fun. E-STEM Option 1 Storm Drain Litter Catcher Design Challenge – Learn the top pollutants in the Rappahannock River while discovering the importance of our stormdrain systems. How can humans use stormdrains to keep our water clean? E-STEM Option 2 Build A Barge – The Rappahannock River is used for travel, commerce, and recreation. Students experiment with the properties that cause items to sink and float then design and build their own barges. Which team’s barge will float the most weight!?! After you have chosen E-STEM Option 1 or 2, pick a bullet from Program A to design the unique field trip for your students. Wetlands: Snowden and Beyond – Hike to a wetland ecosystem, learning about plants and animals along the way. Deduce how wetlands help wildlife and the river. Just Around the River Bend – Explore the diversity of plant and animal life, their inter-dependency, and their relationship with the river. Water Cycle Game or Food Web Game (choose 1) – Both of these activities cover important topical vocabulary disguised as a fun game! Signs of Seasonal Change – Why do the leaves change colors and drop from some trees? How do animals survive during winter? Collect and analyze evidence of seasonal change to answer these and other questions. Rappahannock Connections – Discover how the Rappahannocks, an American Indian Tribe of the Eastern Woodlands, used their natural resources to meet life needs. Investigate their respect for nature through pottery, artifacts, and oral tradition. E-STEM Option 1 Paddleboat Design Challenge – Students learn about renewable natural energy while designing paddleboats that use stored chemical energy (batteries) or solar energy (with sun cooperation). Students will learn about basic electrical concepts as they design boats that will be tested on the river! E-STEM Option 2 Windmill Design Challenge – Students discuss how humans use renewable natural energy in wind to generate energy that will perform work. Students discover how windmills convert moving air into usable mechanical energy. After you have chosen E-STEM Option 1 or 2, pick a bullet from Program A or B to design the unique field trip for your students. We All Live Downstream – Deduce the benefits of riparian buffer zones along our river, discuss erosion and pollution’s impact, and propose solutions. What Is A Watershed? – Where does the water go? Manipulate a model of a watershed to better understand human impacts on ecosystems. Commit to Conserve – Find out how you can protect our waterways and commit to an action that will help. Survivor: John Smith – Visit the northwest extent of John Smith’s exploration of the Rappahannock, comparing Virginia resources now and then. Through tasks and role playing, simulate the Jamestown settlers’ effort to survive and fulfill responsibilities to the Virginia Company and the King. 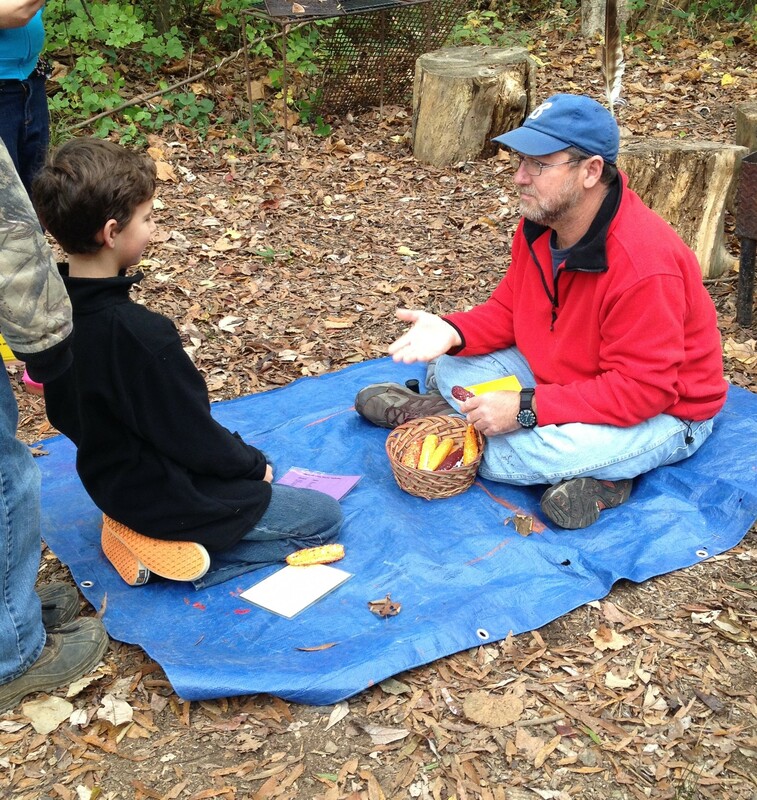 Rappahannock Connections – Discover how the Rappahannocks, an American Indian Tribe of the Eastern Woodlands, adapted to their environment and used their natural resources. Investigate their respect for nature through pottery, artifacts, and oral tradition. E-STEM Option 1 Stormwater Sediment Filter Design Challenge – Learn the top pollutants in the Rappahannock River while discovering the importance of our stormdrain systems. Students learn while they engineer stormwater filters for the top pollutant. E-STEM Option 2 Hydro Power Design Challenge – Students will discover how humans harness and use the renewable natural resource of water as they design and test their own prototypes. Water Quality and Protection – Students will perform both biological and chemical water quality tests. Biological tests include benthic macro invertebrate sampling; chemical tests include data collection via handheld digital probeware and traditional chemical tests. Riparian Buffer Hike or Wetlands Hike (choose 1) – Students will learn why these ecosystems are important by investigating their impact on our watershed. Environmental Literacy and Ethics – How do you interact with the environment when no one is looking? How do your environmental ethics compare to those of your peers? Students learn how to advocate for environmental issues they care about. Conserving the Natural Landscape – Students play the role of key stakeholders in a mock public hearing about land rights issued through a conservation easement. Learn how easements work and why they are a valuable. E-STEM Option 2 Hydro Power Design Challenge – Students will discover how humans harness and use the renewable natural resource of water as they design and test their own prototypes. Extenstions include testing how much load prototypes can pull and how much energy is generated using an ammeter. E-STEM Option 3 Wind Turbine Design Challenge – Students will discover how humans harness and use the renewable natural resource of wind as they design and test their own prototypes. Extensions include testing how much load prototypes lift and how many LED lights will stay lit. Is your school in the Headwaters of the Rappahannock River? If your school is in Fauquier, Rappahannock County, Orange, Green, Madison, or Culpeper our mobile Environmental STEM or E-STEM programs may be an option for your school! Please contact Meredith Palumbo, Field Trip Coordinator, at fieldtrips@riverfriends.org for more information. Nature Journaling (appropriate for 2nd-8th grades) – Discover the value of natural places using science, history, and art. Hone your observation skills and record nature along the scenic Rappahannock River. Water Quality Testing by Canoe/Kayak (12 yrs. and up) –Collect water samples from different tributaries of the Rappahannock by canoe/kayak. Complete chemical water quality tests of the different samples to compare and analyze.